When you run your own business, sometimes purchasing additional real estate or even fitting a modular building on your property isn’t an option. If you need to utilize excess space in your industrial space, you may want to consider custom mezzanines. These mezzanines are easy to install and designed to fit the space you have available. Mezzanines take advantage of space you already have available in your workplace that you are not already utilizing. Because modular mezzanines are built up, you can use empty space that is otherwise unusable. The concept is similar to installing a bookshelf, you are making use of empty space that would otherwise be empty. The modular mezzanines are constructed between two permanent floors. While many industrial sites only have one unit, providing a lot of extra space between the floor and ceiling, structural mezzanines can be constructed between a first and second floor etc. 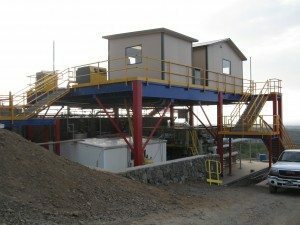 Prefabricated mezzanines are typically constructed of steel. Because these units are most often used in industrial sites, the steel structure is ideal. Steel is durable, strong, and easy to maintain. 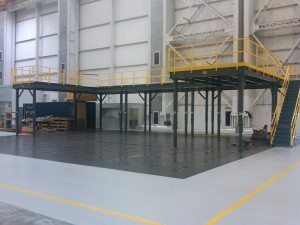 Depending on what you are using your prefabricated steel mezzanines for, the flooring can be made in any fashion, including designed for cement. Additionally there are wood and laminate flooring options you can put on top of the traditional metal flooring if you are using the area as an office space. Mezzanine offices: Using the unused space in your industrial building for an office, is a great way to utilize Panel Built mezzanines. By putting your office space up and away from the work floor, you can eliminate a lot of the noise and dust from the work area. Additionally, it helps create a more professional and set apart area for management. You may also consider using this type of space for a conference room where you can host potential clients, buyers or investors. Office mezzanines are designed to accommodate everything you need in your office space. Catwalks: You can utilize mezzanines by Panel Built to create extra space for walking around the work place. Additionally, this provides a safe vantage point to view operations without disrupting work flow. Catwalks also provide a safe way to access very large equipment such as industrial blenders. The industrial structures include safety rails to ensure that your workers are safe while performing job duties. Storage: Freestanding mezzanines can be used for additional storage space for equipment, product or other tools necessary for the job. When floor space is limited, utilizing the excess space between floors is a great way to store excess product or other items. A mezzanines price is well worth it when you utilize these units for storage. You can add a lot of extra room, reducing your need to find a bigger property. Alternatives: If you are unsure about a steel structure, Panel Built also creates cold-rolled mezzanines. These structures are more cost efficient for many businesses. The cold-rolled structures are lighter weight, cost less to ship and require less equipment to install. This type of structure uses beams to support the floor. While cheaper, these units hole less weight and can handle less pressure in individual areas that steel structures. If you are looking for a the best modular mezzanine structure that will offer additional storage space for relatively lightweight products, it’s a good, less expensive alternative. Using these types of structures to create extra space in the work area is a popular trend with businesses, because it works. Whether you are looking to quickly add additional office space, make room for more inventory, or create a safe way to traverse the work floor, Panel Built can help you create the space with a custom order mezzanine system. We offer mezzanine systems in all sizes. Each unit includes safety stairs, railings and handles to ensure that your guests and employees are safe according to the strictest industry standards. Before you order, check out the type of mezzanine systems we offer. We can also create custom units to fit any workspace. Your mezzanine structure will come dissembled. Each order includes detailed instructions for quick assembly. If you need help with assembly, our technicians are available for more detailed instructions, or to help you assemble your new units. Each office unit includes additional features you can add to make the space feel more natural and comfortable. Options include flooring styles, windows, electrical hookups, bright lighting and temperature control. You can create a comfortable break room, conference room or office space that is quiet and separated from the work floor. Each office space also includes a door with a lock. You can choose from several types of doors to suit the look and feel of your business. In addition to providing prefabricated office space we can also work with you to design a custom unit. If you are unsure about the type of space you need, our designers can work with you to develop the right work space for your building. Your mezzanines and custom office spaces are portable. This means that if you do decide to purchase a new property, you can take the structures with you. Your mezzanine and office space can be completely deconstructed and transported to your new location with ease. For more information on the type or mezzanine and portable office spaces we provide, contact our customer service line at 800.636.3873.